Hey guys! 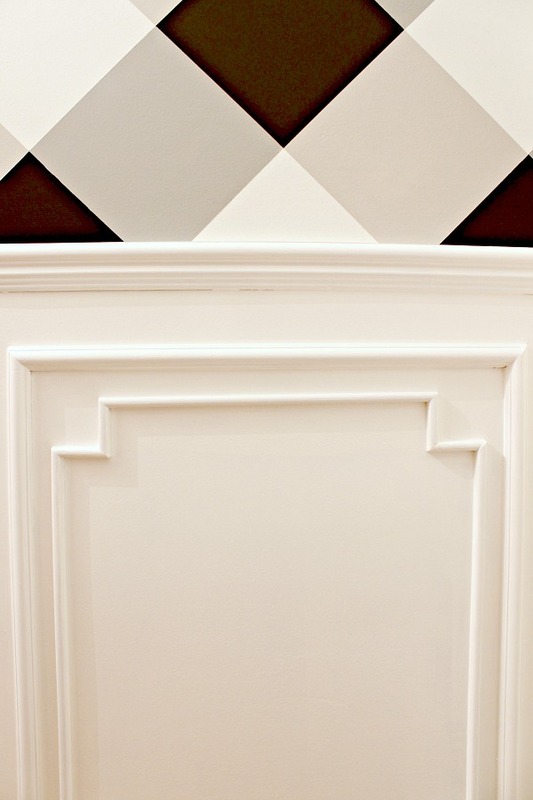 I am in the home stretch of wrapping up my Powder Bath for the One Room Challenge Reveal TOMORROW! As I write this post Tuesday evening, I still have 2 semi-major projects and 4 odds and ends to finish up, then I can clean, style, and photograph! I have literally used every spare moment (in between lots of recent events/parties) and lots of multiple nights to wrap this thing up. 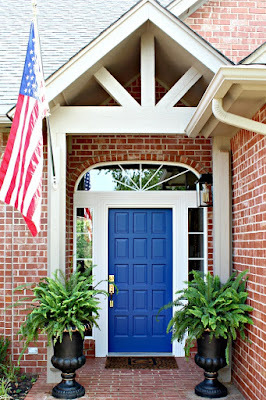 And to think I thought this would be a fairly quick and easy makeover! So, sorry the blog has been slightly neglected lately! I'm piling up lots of good things to share with you and will be back to a normal posting schedule next week. Thanks for hanging in there with me, and here's a sneak peek that I shared on IG because y'all are so sweet! I'm also well aware that I haven't shared a full reveal of our patio yet. I was waiting for things to get green and pretty outside, and it's taken me forever to finish up accessorizing the space. I think we're close, though! 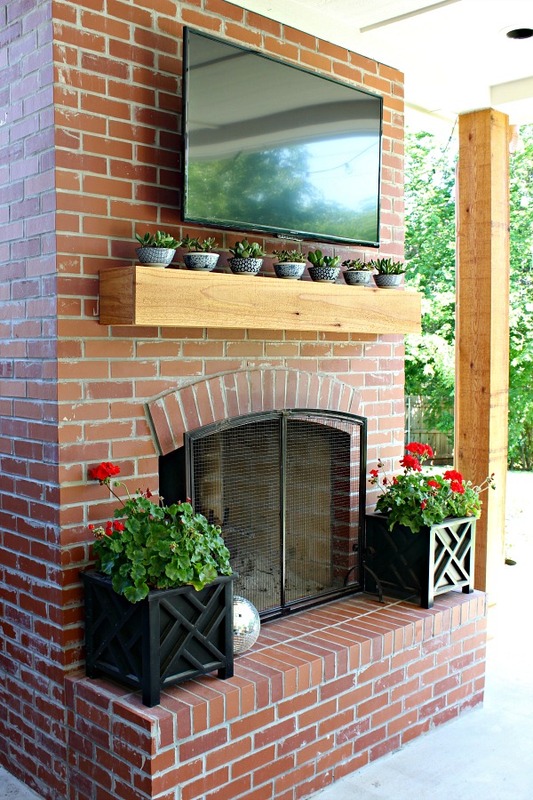 *The open space on each side of the mantel beside the tv is small, so anything tall placed there would have to be skinny. *The wind can get brutal out there at times. I had a pair of metal lanterns sitting on the ends of the mantel for a while and one of them actually blew off and shattered one night. So, whatever it is needs to be heavy. *For the same reason, I can't use anything that's too top-heavy- it would be like a sail in the wind. *It needs to be outdoor friendly and cute! 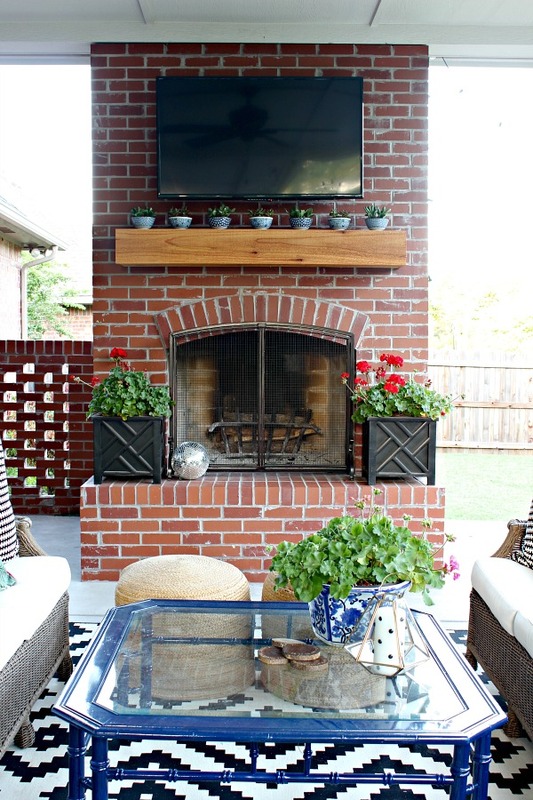 My original plan was to find two tall, skinny lanterns to flank the tv, and either set them on the mantle or use hangers and mount them to the brick on each side of the tv. I never found the right size that I loved, and after lantern #1 blew off, I ditched the idea of just setting them on the mantel. 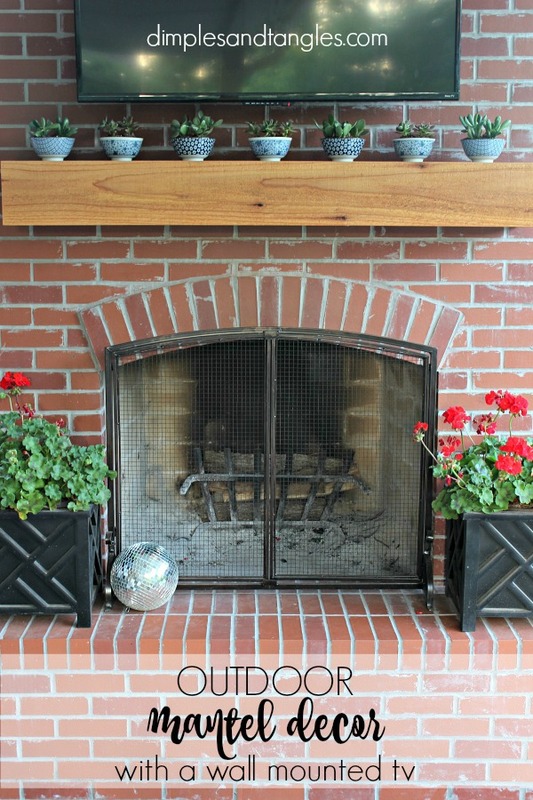 I also wanted to find some kind of planter that was long and low to go under the tv, but at the same time didn't want things to get too busy, especially since I have plants under the mantel on the hearth. I knew I'd need to find a container that was long and narrow, and thought the chances of finding the right size were slim. I could have built a box out of wood, but didn't want that since the mantel is basically a big wood box. A few weeks ago I hit Lowe's at just the right time when the clearance plant racks were full. They had darling little succulents for just $1 each. I knew I wanted to use succulents on the mantel even though I hadn't figured out the container yet, so I snatched up 9 or 10. 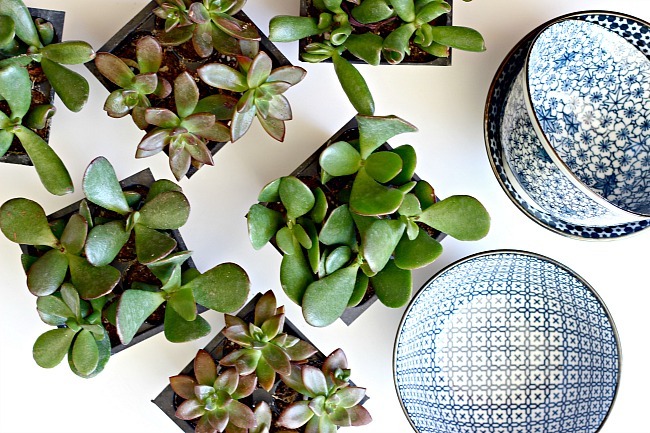 Inside the house I've planted several succulents in small cups or mugs, and while dusting around those I thought about those cute little patterned rice bowls that are good for so many uses, and thought they would be perfect with the succulents in them. And, they're low and weighty enough that the wind won't bother them, and I could use multiple bowls to line the mantel all the way across. Bingo! Of course Anthropologie has some good options (too pricey for this project and slightly larger than I wanted) and World Market does too (but no store here in OKC- boo! ), but I knew I had seen them at TJ Maxx and Marshalls. Marshalls is right around the corner, so I checked there and they had a a good variety of blue and white (perfect!) choices. (Similar bowls to mine here.) I wanted some variety in the bowls but for them still to all relate, but this idea would be just as cute with any color combo, or even with all different designs. 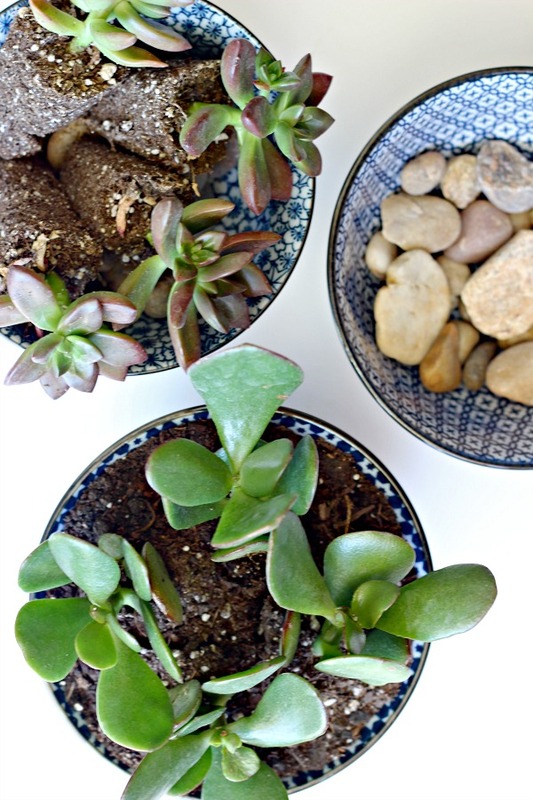 I like this design also because in the winter when it's cold I can just stick some faux succulents in the bowls. 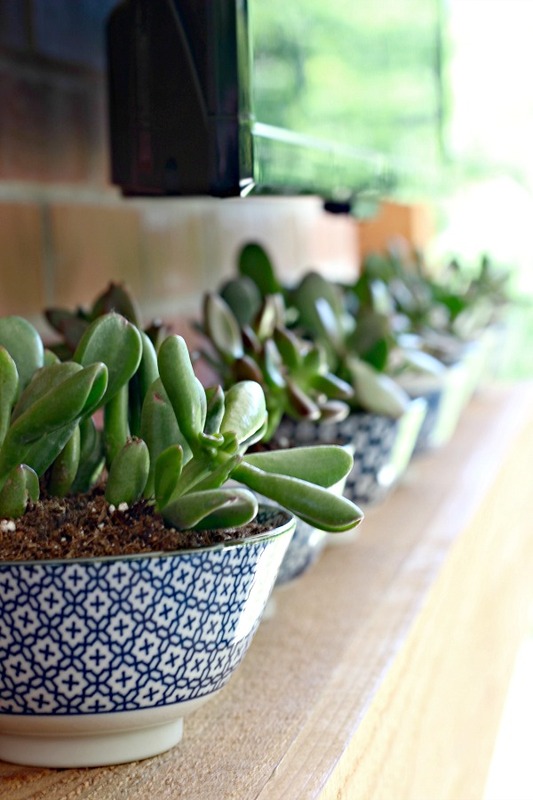 You could do the same if you're not confident with live succulents, or if you want to use them in an area without much light. Hobby Lobby has some great looking faux succulents. It would also look nice to add some moss to cover the soil, especially if you use faux succulents, but I left mine uncovered for now. I think birds would take off with the moss for their nests! Alright, with the mantel decor box checked, we're one step closer to being finished on the patio! I've been too busy with the ORC to get some pots together, and I'm searching for one more great pillow fabric to use out there, and then I'll be ready to show you! 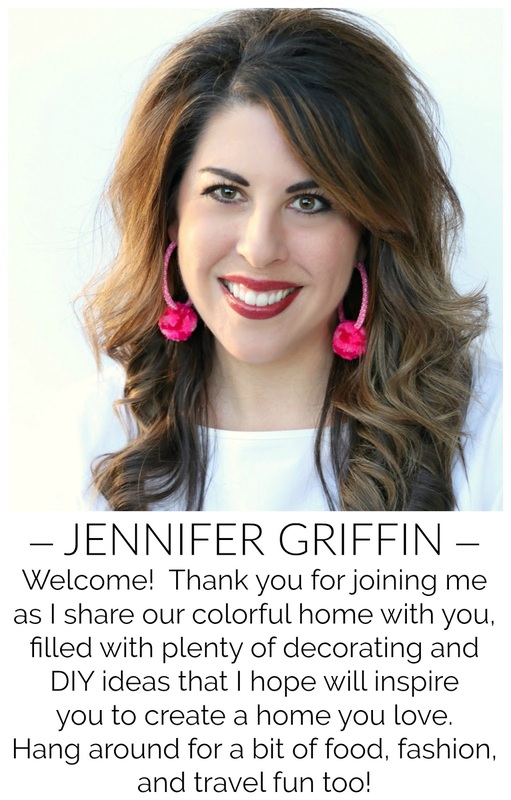 See you tomorrow for my Powder Bath reveal, and in the mean time check out all of the featured designers' room reveals today! I can't wait to see them all! That is such a great idea Jennifer. Our TV is mounted over our mantle in our family room and I miss that space! I love the succulents! Jennifer! It all looks beautiful! I am anxiously awaiting your reveal of your powder bath! Really nice, I like how you walk us through your thought process. Here in California we secure things like those small bowls with museum putty, helps during the smaller 'quakes anyway (not kidding). I also use small bits on the back of picture frames to keep the frames from tilting off level! Love the outdoor coffee table. Any suggestions on keywords to search for one locally?